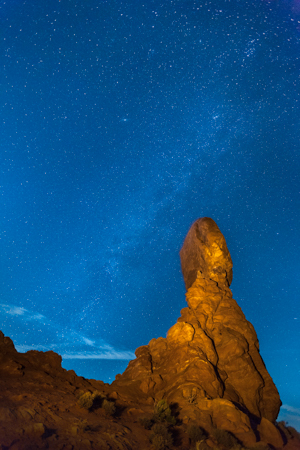 What happens in Arches National Park after the lights go out? Aperture Academy is back at it again with a stellar group of photographers that are curious to find out the answer to this and many more questions of the night sky. Mike Wardynski and I embarked on a moonlit journey to help four excited students capture some amazing images after dark. 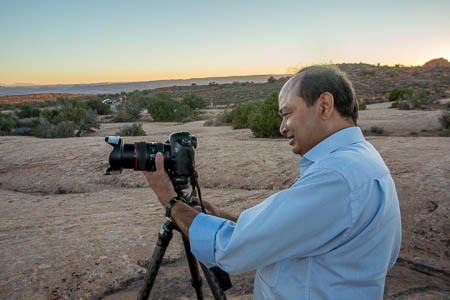 Successful night photography is dependent on a few different very important factors. Mostly clear skies will help your visibility of the starts that you may be trying to capture. The time of year depending on whether you are shooting the milky way or doing star trails can help. Lastly having the proper gear is key to a successful night shoot. Fortunately for our group, all of this was taken care of beforehand, so they were along for the ride. Mike and I met up with the students at the hotel in Moab for a quick orientation to get more acquainted with these super cool folks. After we felt comfortable and the plan was laid out, everyone went and grabbed the gear that was needed for our next 8 hours in the field. Our first stop was the longest and, arguably, the most delicate arch in the park, Landscape Arch. This arch stretches almost three hundred feet across and looks as if it is going to split right down the middle. It is just a matter of time before this old arch crumbles into sand and is carried downstream by the Colorado River. After a quick 30 minute hike we set the group up in one of our favorite places to photograph the arch. After everyone had their lenses focused in, Mike and I went around and helped everybody set up their cameras for the milk way. 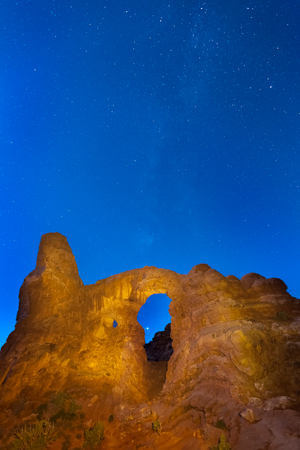 The Milky way was perfectly positioned perpendicular to the arch, seemingly striking directly through it. After everyone had a few images to choose from Mike and I set everyone up with settings for light painting. 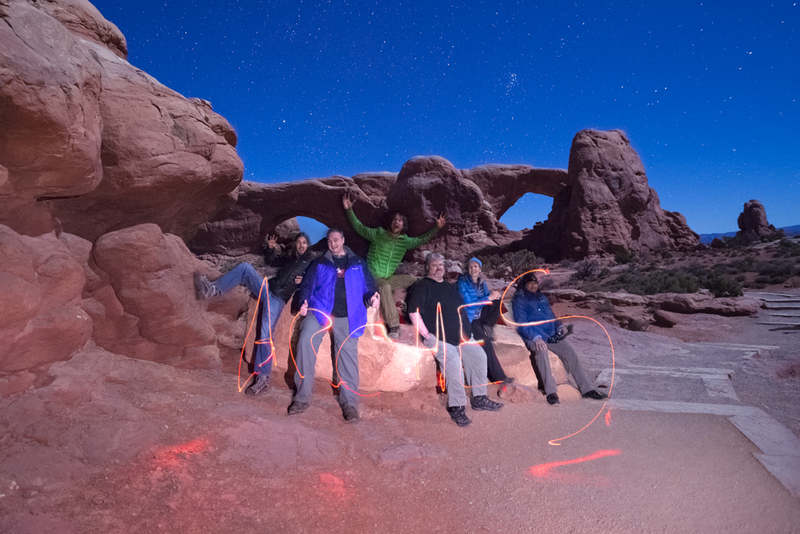 Mike and I took turns with the flashlight, lighting up the arch using a warming gel over the light to make it pop. After trying a few more compositions Mike and I got everyone packed up and hit the trail. After about 20 minutes or so we took a side trail to a lesser know arch, called Pine Tree Arch. This Arch has an interesting Juniper conveniently placed in the middle and faces the north star. We set the students cameras and intervalometers up and waited for them to do their magic. 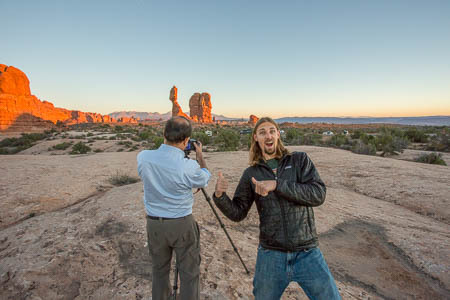 After an hour of waiting we checked the cameras to make sure everything came out ok and headed to our next stop, Double Arch. 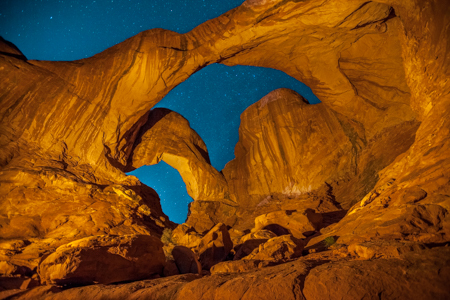 Double Arch looks like something from another planet. Its long stretching arms rise high overhead look like tentacles from an age old octopus. Mike and I got the group set up directly under the arch and painted the arch with a flashlight to bring life to the scene. After light painting, the students photographed the milky way beyond before packing up for the night. 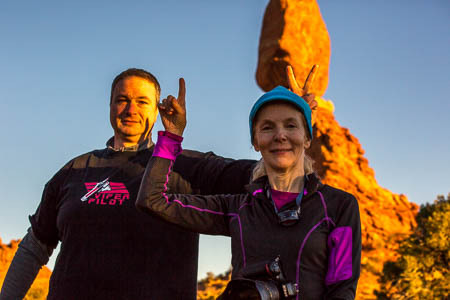 On day two we started a little early and headed up to the park to photograph the sunset at Balanced Rock. Balanced Rock is exactly that, a giant rock that has been withered away at its base, leaving a giant stone of a different sedimentation on top. 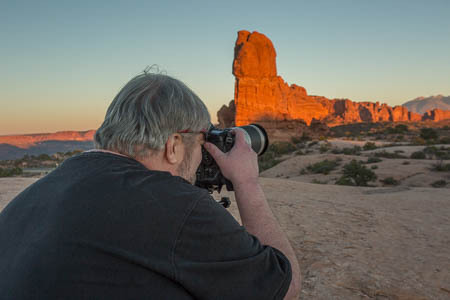 This is a great place to catch a sunset, with the towering La Sal mountains in the background. After sunset we headed back toward the entrance to photograph the Courthouse Towers. The Courthouse towers area showcases giant monoliths of sandstone left over from years and years of weathering. The students captured a few shots of the milky way while it sat directly overhead and then set their intervalometers up for star trails. After an hour of star trails we headed on to our next spot, Turret Arch. Named after the large tower of stone on the left of the arch, Turret Arch is positioned in a nice location for night shooting. 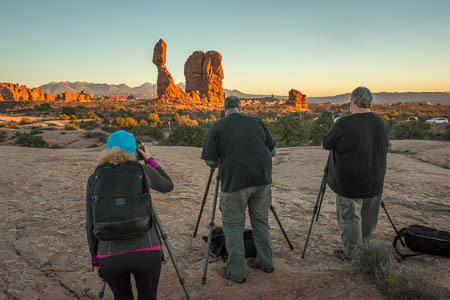 We hike about 1 mile up to the base of the arch and helped the students with compositions. The milky way was positioned perfectly like an arrow through the gaping arch. After everyone was satisfied here, we moved on to our last but not least stop, back to balanced rock, this time with the milky way as a backdrop. Mike and I took turns lighting up the rock from different angles and then called it a night after everyone was happy. The group was tired but it was not over yet. After a good night sleep we worked with the students for a few hours to process all of their photos in Photoshop and Lightroom. After the four hours were up we said good bye to yet another great group of students. Mike, Phil and the rest of the Aperture Academy Team!